A couple of months ago, my husband Ben launched his first digital course. 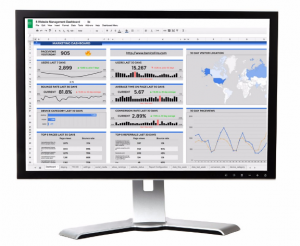 The course is about how to Build Dashboards With Google Sheets and Data Studio — Ben is a spreadsheet developer and data analytics instructor. 1. I’m fascinated by the world of digital products and making a living online. His launch was a chance for me to learn more about how to make an online business work. 2. 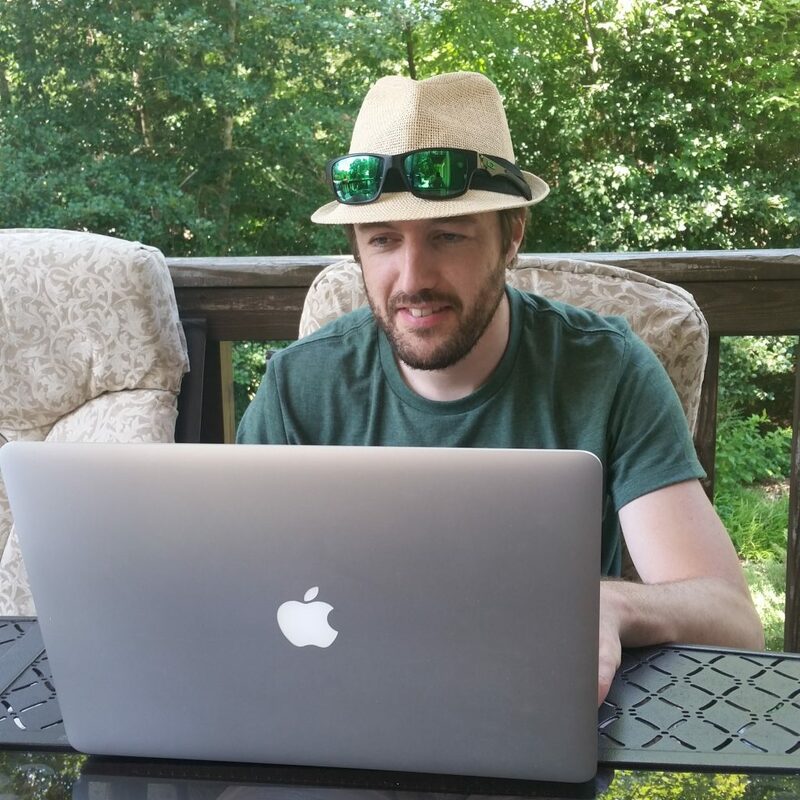 This launch puts Ben one step closer to his goal of earning more income from his blog. That makes him happy, so it makes me happy, too. It’s also good for our family, because it helps him continue to be location-independent for work, which gives us flexibility (and allows us to move for my job as needed). I am so proud of him for transitioning from the corporate world, where he worked as a forensic accountant for a law firm, to creating his own career! Ben at work on his online course. But I’m not writing this blog post to tell you about how amazing my husband is. (Although if you want to read the story of how we met on Twitter, it’s here.) I’m writing this post because Ben did a number of things well when launching his first digital product, and I want to turn those into lessons for all of us. First though, a quick recap on why I believe creating and selling digital products is one of the best ways to earn a living online. Why create a digital product? + You can sell them again and again. While products can take a long time to create — especially if you’re dedicated to offering a high-quality product — you can sell them many times over, maybe even indefinitely, depending on the topic you choose. I’ve seen this with my ebooks. I created them years ago, and they still bring in money each month with minimal effort on my part. + They can sell at a high price point. Because digital products typically offer high value in a niche subject matter as well as a personal touch, buyers are often willing to pay top dollar. I wrote about this a few years ago, and the information still stands. While a novel on Kindle typically costs less than $10 on Amazon, informational ebooks and courses can sell for far more. A few examples from my own library: How to Start a Part-Time Social Media Business, my most popular ebook, sells for $24, and How to Create a Freakin’ Fabulous Social Media Strategy (which is newly updated!) sells for $59. At The Write Life, we offer an ebook for freelance writers called Get Better Clients and Earn More Money that sells for $23. Ben’s dashboard course — which is far more intensive than the other product examples here, with 9 hours of video — costs $149. While there’s no magic formula to choosing a price, the key is justifying the cost and then delivering an amazing product that makes buyers happy. + Profit margins on digital products are high. Your main cost when creating a digital product is your time. Because it’s delivered digitally, you don’t have to pay to print or mail it. Third-party digital delivery tools tend to be low cost: I use what’s probably the simplest of them all, e-junkie, which costs just $5/month; Ben uses Teachable, which offers a tiered pricing system starting at $39/month plus 5% of your revenue; and Gumroad, which starts at $10/month plus fee for each transaction of 3.5 percent + 30 cents, is another popular option. Other possible creation costs include hiring an editor or designer to create a wow-worthy cover or inside-the-book design. Reading my list of pros, you’d think creating and selling digital products is a no-brainer… but there’s a catch. To be successful, you need one vital component that can be hard to come by: people to buy your product. That means you have to be good — or learn how to be good — at marketing. Specifically, online marketing, or growing a community of people online who want what you offer. You can do this in lots of ways — through a blog, or social media, for example — but I believe the most effective way is through an email list. Back to our case study: the launch of Ben’s dashboard course. So far, Ben has earned $15,000 from his course, including about $8,000 during launch week. The best part about those earnings is they will continue to grow. Ben now has a high-quality course he can promote and sell for as long as he’d like, and a consistent slow burn of purchases means a good chunk of revenue over time. Having an email list is one of the best things you can do for yourself before a product launch. And not just any email list, but a high-quality list of people who actually care about the type of information you provide. Ben spent the last year growing his list. He did that by blogging consistently and emailing his insights to his list. He doesn’t blog every day or even every week; he focuses on long, high-value posts, so he only ends up publishing about three a month. And yet that was enough to grow his list to 3,000 readers by the time he launched his course. Now, 3,000 subscribers might not seem like a lot compared to some online entrepreneurs who boast hundreds of thousands of readers. But Ben’s likely to have a much higher sales conversion rate than online personalities and brands who have huge lists, because his includes relevant readers, people who truly care about everything related to data and Google Sheets. He grew his list in a white-hat way, acquiring subscribers little by little, so he sees a high open rate of 30+ percent — which bodes well for converting sales. Ben also used a pro email marketing strategy right from the get-go to lure new subscribers: he offered a freebie to anyone who signed up for his email list. This isn’t some shoddy one-page freebie, but a high-value, 79-page ebook called Spice Up Your Sheet Life, which includes 35 tips for using Microsoft Excel and Google Sheets. Not only does that free ebook bring in lots of new signups, it also has another effect that helped Ben sell courses: because it’s well done, it proves he knows what he’s talking about. That value turns some people who are only semi-interested in his work into evangelists who closely follow his blog… and might be willing to buy his products. Speaking of getting people excited about his work, Ben dropped bread crumbs throughout his newsletter, blog posts and on his social channels in the months leading up to his course launch. He wasn’t salesy about it, but he let his community know what he was working on, and how much he looked forward to sharing it with the world. His mentions got people’s attention. In fact, a number of readers asked Ben when the course would be ready, which showed him there was an appetite for the product and motivated him to finish it. Once Ben had a draft of the course ready, he asked his newsletter subscribers if anyone was interested in being a beta participant — to take the course for free and give him feedback before launch. More than 125 people wanted to participate! He ended up selecting just 10, and the feedback from those beta testers helped him improve the course. Ben also wrote a series of pre-launch emails to his newsletter list, including some cool examples of dashboards he built and how he used them to get results for himself or his clients. Again, this was not only helpful for Ben’s readers, it also served to prove Ben’s know-how in a non-salesy way; it was obvious from his emails that he was good at this and his course would be high value. Ben’s course costs $149. But if you got your hands on it during launch week, you could get it for 50% off. $149 is pretty darn good for a course with 9 hours of video tutorials on a niche topic… and $75 is ridiculously good. That discount — and the deadline that accompanied it — motivated many of Ben’s email subscribers and online followers to invest in the course right away, and some even shared it with their friends. This, of course, is the most important part: Ben’s course provides awesome value for participants. In the Facebook group he created for participants, people often write unsolicited comments about how helpful the course has been for them or what they learned. Those testimonials are gold. Those people will now tell others about their experience with the course, and word of mouth is a wonderful sales tactic. They’re also highly likely to purchase another of Ben’s courses in the future. Promotion is the name of the game if you want to earn revenue from your online work — but it’s only as good as your product. In the end, you’ve gotta back it up with an awesome ebook or course participants will rave about. Using these tactics, Ben managed to avoid the biggest fear of product creators: launching to crickets. Instead, he was supported by a relatively small but highly engaged group of people waiting to purchase his work. Since his launch, his course continues to sell, about one course a day over the last two months, many of those sales coming from people who land on his blog after asking Google how to execute one of the Google Sheets tactics he explains there. Meanwhile, he continues to look for new ways to promote the course and grow his email list. And because this launch was successful, he’s also well on his way to creating his next course, on how to clean data and use pivot tables. Got any questions for Ben about his first course launch? He has offered to answer them in the comments!